Thus the things he wished to forget kept coming back, in shards of stories or absurd details, and whether hell or heaven was the subject, shards and details like these were the puzzle pieces I had to fit together before I could begin to understand what had gone on inside him all his life: the battle between the transcendent, which he yearned for, and the memory of death and destruction, which held him in its clutches. When you learn that Urbain was born in 1891, it’s not hard to guess where all this is heading. Sure enough, the second section takes us into battle, with the writer putting his musings aside in favour of his grandfather’s own first-person account of the First World War. As the Belgian army is pushed back by the stronger, better-equipped Wehrmacht, Urbain (writing decades later) describes the hardship, the terror and (unbelievably) the boredom of the average soldier in the trenches. However, there’s a further twist in store. The third part takes us back to the grandson, and as he briefly describes Urbain’s life after the war, details from the first section suddenly make more sense, and the picture of the old man’s life is finally complete. This style runs throughout the first and third parts as the writer switches between reflecting on his memories, examining the notebooks and travelling around the country in search of places his grandfather mentions. One of the strengths of the novel is the gradual development of Urbain’s character, with Hertmans revealing more information with each page. Perhaps the most striking feature of his grandfather is his passion for painting, inherited from his father (hence the title), and the grandson attempts to discover the background behind the many oil paintings the old man left behind (often copies of masterpieces). In the second section, Urbain himself recounts his drive to draw, even in the midst of war, using charcoal and any scraps of paper he can get his hands on to sketch his comrades – many of whom will soon be dead. While it’s easy to focus on the conflict, in fact, it’s the painting that takes centre stage, and the way Hertmans structures his work, using his grandfather’s paintings to drive his narrative, with secrets hinted at in the first section being revealed towards the end of the book, pushes us to concentrate on the man rather than the war. One of the most intriguing aspects of War and Turpentine is the shadow the writer places over his grandfather’s marriage near the start of the book, and it isn’t until the final section that we learn the truth, even if the evidence was (literally) in front of our eyes all along. Urbain Martien is a war hero, a loving son, husband and father – and yet his is a life unfulfilled, with a certain regret marring his later years. Yes, it’s easy to move on in a time of peace, but it’s also important to remember the past, both the major historical events and the people who lived through them. This is an interesting one… After the first part, with its wonderful Sebaldian tone, I was pencilling it in as a contender, but once we got to the middle section, with Urbain’s reflections on the war, it lost me – not because it was bad as such, but because it was just another war story, and I’m not a huge fan of the genre. If you’re going to write about the war, you’re going to have to do a lot to justify your choice, and this was just OK.
I’ll say yes. As you may have noticed above, my main reservations about the book are rather personal and reflect my own reading biases. This is very much the kind of book that you’d expect to do well, both for the MBIP literary nature of the work and the subject matter that would have done well in the old IFFP too. 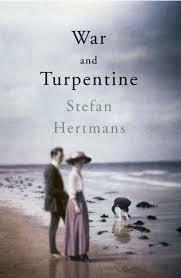 War and Turpentine will impress a lot of people, and I suspect the judges will be among that number. An excellent and balanced review, I liked the sound of this novel but not so keen on another war novel, however this one is all the more intriguing for being inspired by the notebooks, how great that this man has inspired his grandson to use his talent to share his story and another perspective of war from yet another country and population affected by it. Claire – Yes, and even though I wasn’t keen on the middle section, the Belgian view of the war was interesting. Not sure I’d want this winning, though.